I babysat these kids when I was a teenager, and they enjoyed this activity very much! The next time you make rice crispie treats- instead of putting them right into the pan to cool- consider giving your kids a little extra fun with their snack. Give each child a piece of wax paper and a little pad of butter. They will need the butter to oil their hands so that the rice crispies won't stick. 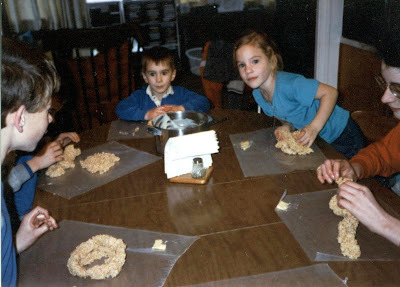 Then divide the still warm rice crispies among the kids and let them use it like modeling clay. I guarantee that a tyrannasaurus rex rice crispie tastes twice as good as a plain old square! What a cute idea!! I love to do stuff like this with my kids. Just like Whitney said, it reminds me of Christmas! Buttering little hands to make green wreathes! Fun tip - thanks!